Vacancy rates for single-family homes and condos nationwide are dropping, another sign of a strengthening economy and robust housing market. 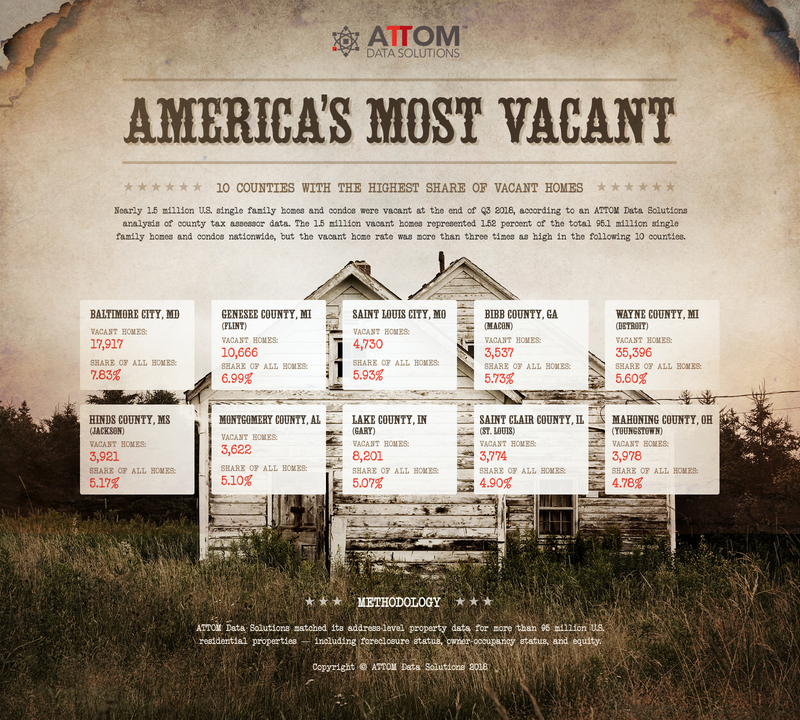 According to the 2018 Vacant Property and Zombie Foreclosure Report by ATTOM Data Solutions, the curator of the nation’s premier property database, nearly 1.5 million single-family homes and condos were vacant nationwide at the end of Q3 2018. This represents 1.52% of all single-family homes and condos, which is down from 1.58% in Q3 2017. Of those vacancies, 10,291 are considered “zombie” foreclosures, or vacant homes in the foreclosure process. This represents 3.38% of all foreclosures nationwide, down from 14,312 or 4.18% one year ago. Overall, the State of Georgia has just over 65,000 vacant properties, or 2.03% of all properties, while zombie foreclosures account for 2.71% of those vacant properties. Nationwide, Bibb County (Macon) was named one of the top 10 counties with the highest share of vacant homes, with more than 3,500, or 5.73% of all properties in the county considered vacant. The report also analyzed vacancies by zip code, and most metro Atlanta zip codes were among the lowest in the country for vacancies, outside of a few south and east Fulton County and DeKalb zip codes. The zip code with the highest percent of vacancies is 30314, with 13.65% or 735 vacant single-family homes and condos. To compile this report, ATTOM Data Solutions analyzed county tax assessor data at the address level for more than 95 million single family homes and condos for vacancy, broken down by foreclosure status and, owner-occupancy status. Only metropolitan statistical areas with at least 100,000 single family homes and condos and counties with at least 50,000 single family homes and condos were included in the analysis.